ICC released the latest rankings after India-New Zealand Women ODI series. 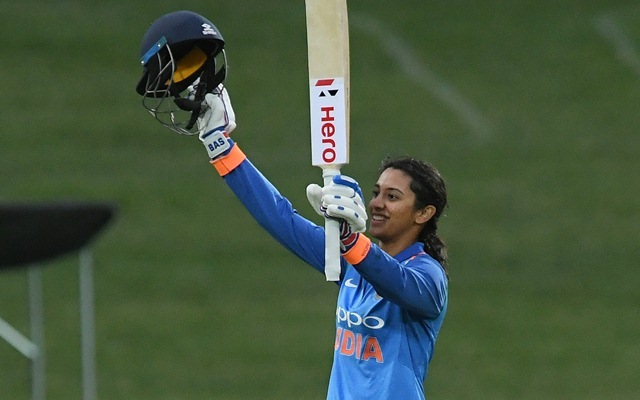 Smriti Mandhana has become the No.1-ranked batter in the MRF Tyres ICC Rankings for Women’s batters after scoring her fourth ODI century and an unbeaten 90 in the three-match series in New Zealand. Mandhana moved up three spots in the batters’ rankings to reach the top spot. She sits above the Australians Ellyse Perry and Meg Lanning, at No.2 and 3 respectively, and the high-flying Amy Satterhwaite, the New Zealand captain who flew up 10 places to No.4. 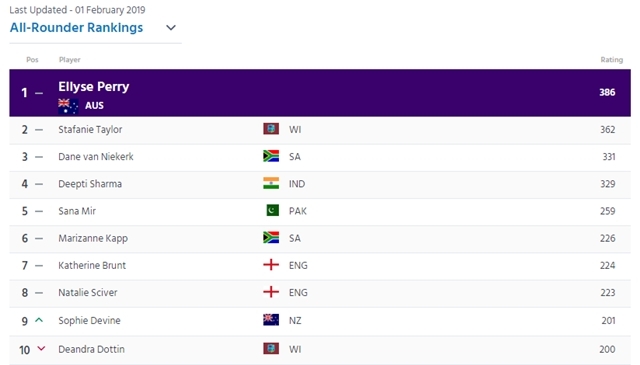 Mithali Raj, who moved down a spot, completed the top five. It was fine recognition for Mandhana, who has been in exemplary form in the one-day format. In the 15 ODIs she has played since the beginning of 2018, she has scored two centuries and eight half-centuries. Satterthwaite was another one to catch the eye. Her jump of 10 places to No.4 in the batters’ rankings is propelled by consecutive half-centuries in the series against India, and four in all in her last 10 ODIs. Fellow New Zealander Suzie Bates, whose half-century in Hamilton propelled New Zealand to victory in the third ODI, rose up one place to No.6. 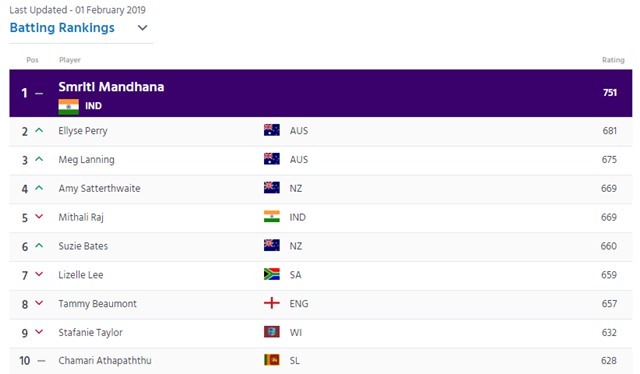 Lizelle Lee (down two places to No.7), Tammy Beaumont (down two places to No.8), Stafanie Taylor and Chamari Athapaththu (both falling by a place each) complete the top 10. Jemimah Rodrigues was another Indian to have a good day at the rankings. She has played just seven ODIs since making her debut in March last year, but a half-century in the first ODI in Napier helped propel a massive rise of 64 places for the 18-year-old. She now sits at No.61 in the rankings. Among the bowlers, there was less activity in the rankings, but there was good news for India’s spin trio of Deepti Sharma, Poonam Yadav and Ekta Bisht. Both Yadav and Sharma jumped five places each and now sit at No.8 and 9 respectively. Yadav took six wickets in the series to Sharma’s four, while Bisht jumped up nine places to No.13 after claiming five wickets in the series. Jhulan Goswami, whose 3/23 in the second ODI set up the series win, rose one place to No.4 and is the highest-ranked Indian in the top five, with Pakistan’s Sana Mir, Australia’s Megan Schutt and South Africa’s Marizanne Kapp above her. There was good news for the New Zealanders too. Lea Tahuhu, the pacer, claimed four wickets in the series, and jumped nine places to No.16 in the rankings. Anna Peterson, who claimed five wickets in the three matches, had a stellar rise of 13 places and is No.45 in the rankings. There was largely no change among the all-rounders. 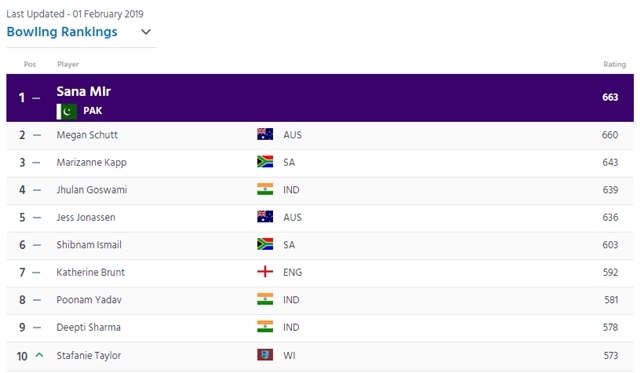 Perry is still at the top of the all-rounders’ charts, and apart from Sophie Devine, who moved up one place to No.9, and thereby pushed down Deandra Dottin to No.10, there was no change in the top 10.